When the Mayflower set sail in 1620, it carried on board the men and women who would shape America: Miles Standish; John Alden; Constance Hopkins. But some among the Pilgrims were not pure of heart; they were not escaping religious persecution. Indeed, they were not even human. They were vampires. They assimilated quickly into the New World. Rising to levels of enormous power, wealth, and influence, they were the celebrated blue bloods of American society. The Blue Bloods vowed that their immortal status would remain a closely guarded secret. And they kept that secret for centuries. But now, in New York City, the secret is seeping out. Schuyler Van Alen is a sophomore at a prestigious private school. Suddenly, when she turns fifteen, there is a visible mosaic of blue veins on her arm. She starts to crave raw food and she is having flashbacks to ancient times. Then a girl from her school is found dead... Drained of all her blood. Schuyler doesn’t know what to think. Could those vampire legends really be true? 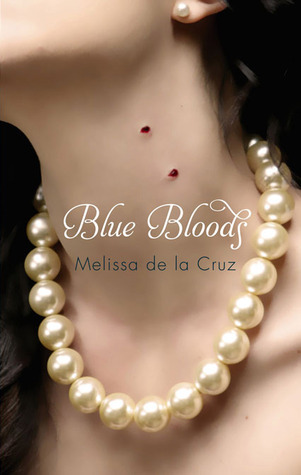 Blue bloods is told from several points of view, all surrounding a group of high society teens all attending the same prestigious school in New York. Wealthy, glamorous and dangerous, the core group belong to a secret society, The Committee. Schuyler lives with her grandmother. Her father supposedly passed away shortly after she was born and her mother is in a permanent state of comatose. Her family is one of old riches, but has rapidly decreased over the years. With only Oliver at her side and loyal bloodhound Beauty, she is asked to join the secret society of the rich and infamous. Bliss is attracted to the new bad boy Dylan. With his cool demeanor and leather jacket, Bliss's parents would definitely not approve. All the teens are connected, they are all Blue Bloods, vampires. Vampires that have immaculate beauty, intelligence and grace. They can consume more than human blood and can walk in the sun. They all share a past, being reborn every century, an old soul living a new life. But someone is hunting them, Silverbloods. Hunting to drain them of their own blood and never to be reborn. The council refuse to acknowledge the problem, but with the Blue Blood inner sanctum not warning the chapter, the teens are taking matters into their own hands... Before it's too late. One word: Boring. Blue Bloods is a tame vampire tale, unique in how vampires came to be, and how the live within guidelines of secret societies. I love the concept, but not the execution. Told from several points of view, we get a glimpse of each character, but can't connect to any of them. Most if the book is brand name dropping and detailed descriptions of designer outfits, bags, outings, it's all very vain and shallow. I would have preferred to see that better spent in character development. It was too frustrating and although I persisted through Blue Bloods, I won't be continuing the series.